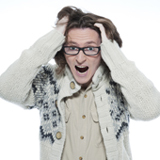 Following on from the successes of his last shows Crowd Pleaser and Different Class, brilliant Irish comedy star, Ed Byrne, is back at the fringe this summer before an extensive national tour in the autumn, with his all new show Roaring Forties. However happily Ed slides into middle age, he isn’t ready for the slippers and woolly jumper quite yet. Still as angry as he ever was, you wouldn’t want to be on the receiving end of one of his withering rants. Family life (now a father of two), and everyday frustrations (seriously something, EVERY day) all come in for a pasting with typically hilarious results as Ed casts his curmudgeonly comic eye over his life. This promises to be a rip roaring night you won’t want to miss. Ed has been very busy since he last was on tour. His many TV appearances over the last couple of years have included a recent foray into factual broadcasting and he has been seen presenting VT’s for BBC2’s Volcano Live and also driving through Siberia for BBC2’s World’s Most Dangerous Roads. He continues to be a regular panellist on BBC 2’s Mock the Week and Have I Got News for You as well as various other new comedy shows including Don’t Sit in The Front Row and Alexander Armstrong’s Big Ask. A sucker for a quiz, particular recent highlights for Ed have been taking part in Celebrity Family Fortunes where his family won the jackpot, Celebrity Mastermind and being a contestant on Celebrity Pointless. Ed is also a regular contributor to comedy and music shows on BBC Radio’s 2, 4 and 6 Music. Ed continues to gig extensively abroad taking in New Zealand, Norway, Austria, Spain and Australia during 2012 and 2013 has already seen him gigging in Austria, France, and Switzerland. Ed continues to be a keen outdoors enthusiast, escaping to the Highlands whenever he can to walk up mountains and has a regular column in TGO magazine. Ed is about to climb Mount Blanc (the highest mountain in Europe) for the second time.